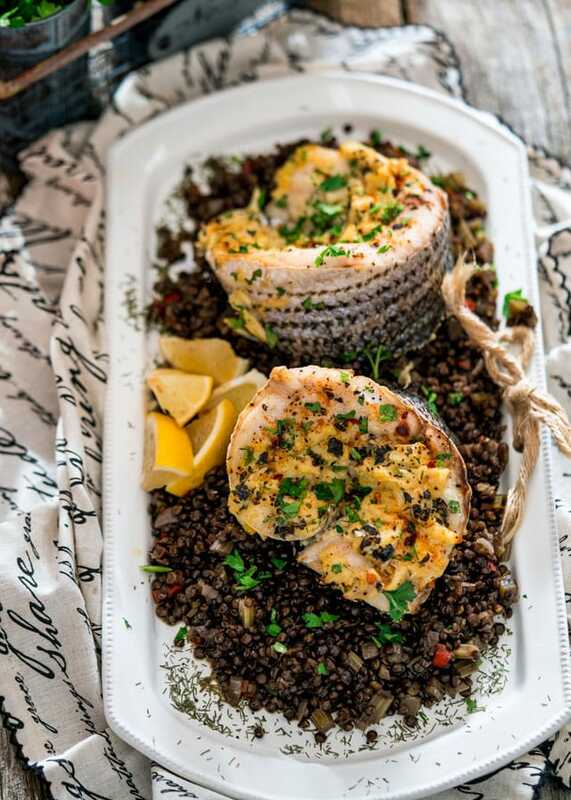 Blue Pointe Stuffed Striped Sea Bass – these delicious fillets of striped sea bass are stuffed with Lump Blue Crab Meat then served on a bed of delicious Beluga lentils. This post is brought to you by Blue Pointe Seafood! I seriously don’t cook with enough seafood, and I know I should, which is why when I do cook with fish, I try and make it special. Like with these gorgeous striped sea bass fillets that I stuffed with a lump blue crab meat mixture. The end result is simply to die for. I mean let’s be honest, this dish is very impressive, like the difference between a cook and a chef. I’m not saying I’m a chef or anything, but if you wanted to impress your significant other, this is how you should do it. 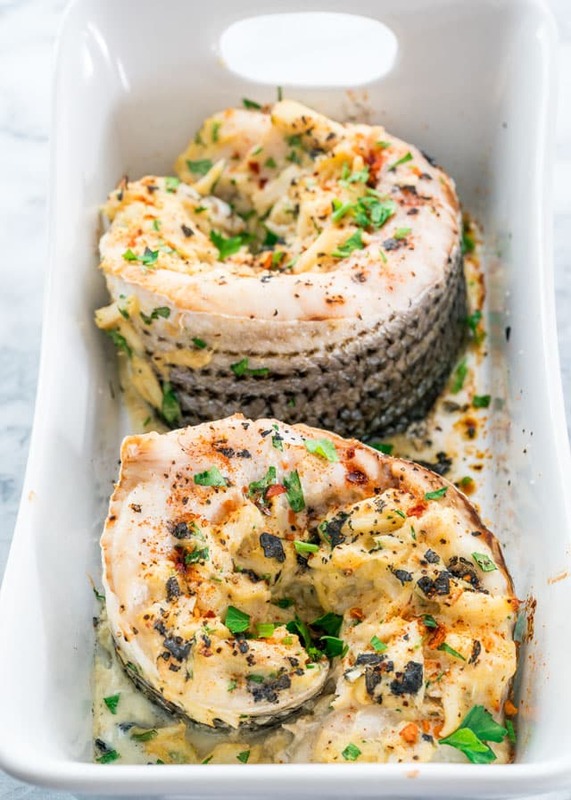 These beautiful sea bass fillets come to us from Blue Pointe Seafood which is located on the Eastern side of the Chesapeake Bay in Kent Harrows Maryland, famous for its world renowned seafood. They’ve been in business for 20 years and will always deliver fresh, high-quality seafood at an affordable price. I have to admit that my favorite part about this dish was the crab filling, although if you’ve never had sea bass before, you must try it. Sea bass has quite a meaty buttery texture and believe it or not, quite similar to the texture of chicken. Whether you grill, bake or pan-sear your sea bass, you’ll always end up with a moist and flaky fish. We’re talking melt-in-your mouth flavor with large and moist flakes. But that crab filling is incredible. I actually made a lot more, and then used to rest to make crab cakes, so good. I decided to pair this sea bass with some Beluga lentils which made an incredible side dish, not to mention they’re really easy to make. Want to give this recipe a try? Order your sea bass from Blue Pointe Seafood! 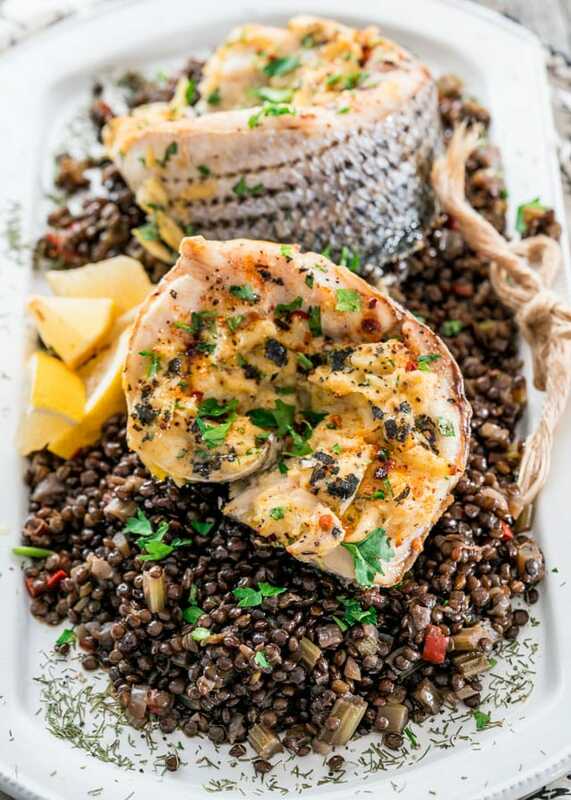 Blue Pointe Stuffed Striped Sea Bass - these delicious fillets of striped sea bass are stuffed with Lump Blue Crab Meat then served on a bed of delicious Beluga lentils. Preheat oven to 375 F degrees. Rinse the fish fillets and set aside. In a large bowl whisk together the egg, mayonnaise, Worcestershire sauce, dry mustard, Old Bay seasoning, lemon juice, sugar, flour, melted butter, and Tabasco sauce until smooth. Gently fold in the crab meat and parsley until thoroughly combined. 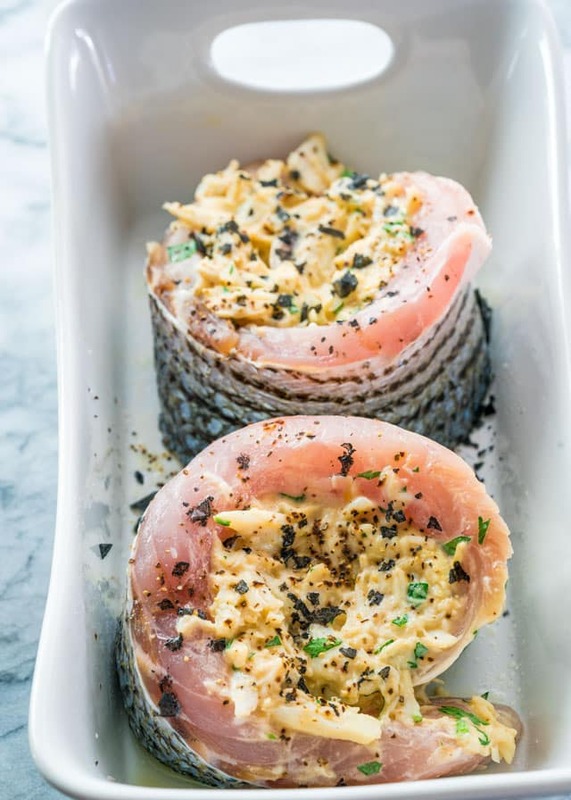 Lay the sea bass fillets on a greased baking sheet and lightly season with salt and pepper. Spoon half of the crab mixture on top of each fillet and roll them up. Sprinkle each roll with salt and pepper. In the mean time, you can prepare the lentils. In a large skillet heat the olive oil over medium-high heat. Add the onion, celery and cook until the onion softens and becomes translucent. Add the red pepper, cardamom, smoked paprika, dry dill, season with salt and pepper and stir. Add the beef broth, chicken broth and beluga lentils. Cook for about 15 to 20 minutes or until the lentils are cooked through and the liquid is absorbed. 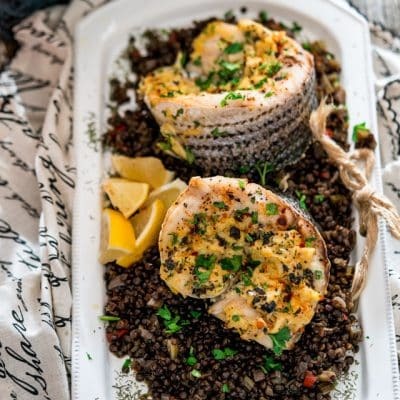 Serve the fish fillets over the lentils and enjoy! This recipe is brought to you by Blue Pointe Seafood. Great Recipe, that’s not “striped sea bass” though. It’s just “striped bass” and it is not referred to as just “sea bass.” Just pointing out as this may confuse the reader looking for a fish that does not exist under that name. Striped bass is actually in the perch family and can be found in fresh, brackish and saltwater. OMG that bass looks to die for! I don’t cook with enough seafood, either. This dish looks fantastic! Thank you so much for the online seafood referral. I am in landlocked AZ and I MISS good seafood. I will order from this group. YEAH! I hope you do, their seafood is amazing! Thanks for the post .Can you say what other fish and stuffing we could use instead of Blue sea Bass and crab. I do not eat shell fish.